A couple of interesting things happened in the world of Web browser usage during October. The more significant one is that Internet Explorer's share of global browser usage dropped below 50 percent for the first time in more than a decade. Less significant, but also notable, is that Chrome for the first time overtook Firefox here at Ars, making it the technologist's browser of choice. Internet Explorer still retains a majority of the desktop browser market share, at 52.63 percent, a substantial 1.76 point drop from September. However, desktop browsing makes up only about 94 percent of Web traffic; the rest comes from phones and tablets, both markets in which Internet Explorer is all but unrepresented. 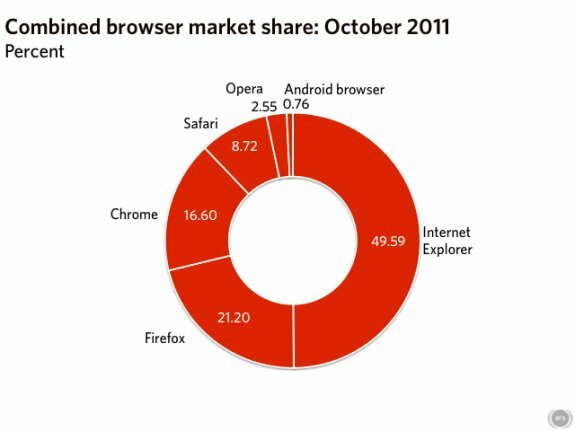 As a share of the whole browser market, Internet Explorer has only 49.58 percent of users. Microsoft's browser first achieved a majority share in—depending on which numbers you look at—1998 or 1999. It reached its peak of about 95 percent share in 2004, and has been declining ever since.